Our Wrangles are the amazing team of dedicated workers who are out at 6:30 am feeding, grooming, and tacking horses. The horses are the highlight of camp. On any given day a camper can tell you which horse she rode which summer of camp. The horses build camper confidence as they face fears and learn new skills. Our wranglers are the ones who make this experience a fun safe adventure. Spend time alone with the Lord everyday; be in the Word! Study your Wrangler Handbook and become familiar with the rules. Assist Horse Program Director (HPD) in feeding and caring for the horses morning and night. Be ready to help HPD with the horse program 1/2 hour before it starts. This may include grooming and saddling the horses. 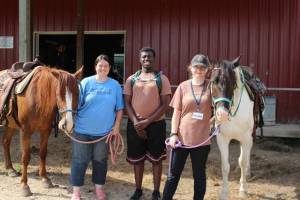 Help lead horses for the horse program. After program time, un-tack the horses and water them. Help exercise the horses during the afternoon/evening. Talk to the campers as you take them on trail rides, and encourage them in the theme for the day. Help with extra camp activities as you are able such as the Princess dinners and the Thursday adventure.